MARLBOROUGH, Mass., Aug. 16, 2018 /PRNewswire/ -- Hologic, Inc. (Nasdaq: HOLX) announced today the U.S. launch of its new Fluent™ fluid management system, featuring innovations designed to provide operating room (OR) staff more simplified and effective fluid management for hysteroscopic procedures. To simplify hysteroscopic operations, the Fluent system features a single waste bag design and unique FloPak™ technology to effectively control fluid use throughout the procedure. An intuitive user interface provides step-by-step instructions for setup, disassembly and troubleshooting, and ultimately helps optimize OR workflow. 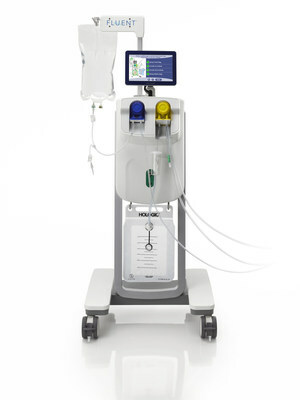 In addition, large visual and audible alerts monitor fluid deficit, pressure, low fluid bags, and full waste bags to help keep procedures moving as efficiently as possible. The Fluent system experiences a change in average intrauterine pressure of less than 1% when running the MyoSure® system. It also has the ability to detect accurate fluid deficit within +/- 50 mL, allowing OR staff to perform hysteroscopic procedures with increased clinical confidence. Hologic's MyoSure suite of products includes the MyoSure REACH, MyoSure XL, MyoSure LITE, and MyoSure MANUAL devices for tissue removal in a wide range of sizes and locations. To learn more about the MyoSure suite of products, visit www.MyoSure.com. For more information about the Fluent system, visit www.FluentbyHologic.com. Hologic, Fluent, MyoSure, The Science of Sure, and associated logos are trademarks and/or registered trademarks of Hologic, Inc. and/or its subsidiaries in the United States and/or other countries. All other trademarks, registered trademarks, and product names are the property of their respective owners. The Fluent Fluid Management System is intended to provide liquid distension of the uterus during diagnostic and operative hysteroscopy, and to monitor the volume differential between the irrigation fluid flowing into and out of the uterus while providing drive, control and suction for hysteroscopic morcellators.